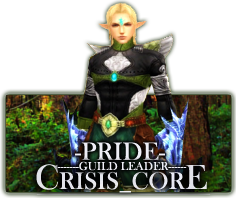 We really need to help Pride this time in order for us to get a Guild House we have to help him come up with $50,000,000 in gold so please help by chipping what you can afford I will be taking the donation's under my alt. Healingfactor starting today until we have met our goal so for those of you that are able to chip in just let me know i have healingfactor camped at arki. On Behalf of Pride and the Core thanks for your Understanding and Help. Also, if anyone has those guilds coins and want to donate them, that'd be great. I'm in a cash flow crisis, and if anyone knows anything about me, you'd know I didn't have a lot of money to begin with DX . I realize how important this is though, and will chip in what I can, when the time comes. It's fine, Kiev :] we've got everything now we're just looking for any members that has guilds coins and seeing if they'd want to donate. So the 50m is raised? Yup... Now we just have to look out for  coins. I think i saw some of those coins in Apu last week and they were for 30mil each. I have about 3 mil, I'm willing to part with 1 mil fo that, and I have some of those +3 stat option items, those will sell for a pretty penny. And laspises, so I may donate 2 or 3 mil. Well, I have 200 mil at the moment now, but I was kinda saving it to buy some of O__o's archer/ranger items, They are quite good and tempting but they roughly price like 300-800 mil. I'll see if I have any spare change once i buy some, Then I'll contribute to the guild. p.s: I didn't quit my UM just coz i wanna quit, but I wnna try being a lone UM ranger for now.